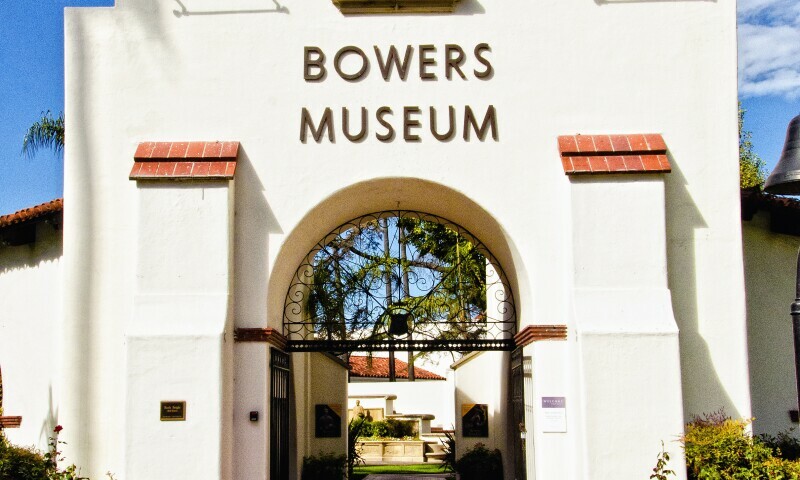 An art museum located in Orange County, California, the collection includes more than 100,000 objects, and features many treasures from different regions. The Bowers organizes and hosts special exhibitions from institutions throughout the world, and travels exhibitions nationally and internationally. The museum has a second campus two blocks south of the main site, Kidseum, a children's museum with a focus on art and archaeology. The collection's works as previously said come from a variey of regions like; Asia, Pacific Islands, and North America. The collection also highlights California's legacy like; "California Legacy: Missions and Ranchos," California Bounty: Image and Identity, and "First Californians." Along wit their permanent collection the museum also hosts special exhibitions through partnerships with museums including: Shanghai Museum, the British Museum, and the Vatican Ethnological Museum. The Bowers has organized several special exhibitions on Chinese history and culture since 2000. The museum board's chair, Anne Shih, who emigrated to the United States from her native Taiwan in 1979, has developed key contacts with Chinese cultural authorities that have given rise to several exhibitions, beginning with "Secret World of the Forbidden City: Splendor From China's Imperial Palace" (2000), an unprecedented exhibit of 350 treasures from China's Imperial Palace that included statues, pottery, paintings and other pieces, as well as recreations of rooms in the Imperial Palace.